High performance, white or gray cementitious adhesive for ceramic tiles, fortified with resins and presenting zero vertical slip. Provides high adhesive strength, it is resistant to moisture and frost, and it develops its mechanical strengths rapidly. 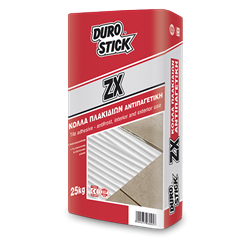 Suitable for tile installations on walls and floors, both indoors and out. Its thixotropic properties allows for wall tile installation top down. Classified C1T per EN 12004.